High-Incidence disabilities make up 21% of the 14 disability categories of IDEA. Multi-sensory integrated technology programs that offer offer sensory cues, prompts, and lessons for social and emotional engagement. Tools such as Talklight help teach self monitoring of noise levels and positive reinforcements . is associated with mental health, mental disorders and severe behavior issues such as being unable to maintain satisfactory interpersonal relationships with peers and teachers, inappropriate behaviors and feelings under normal circumstances. Strategies such as positive reinforcement and incentives to help students learn behaviors that are less disruptive. collaborate with other professionals to help manage the child. Use preventative measures such as devising a behavioral plan and implementing classroom rules and routines to help give a child consistency. Speech or Language Impairment Approximately 20% of children receiving special education. Definition A communication disorder that adversely affects the child's ability to talk, understand, read, and write. This disability category can be divided into two groups: speech impairments and language impairments. Teacher can help with speech and language exercises and can provide the student with immediate feedback when the speech-language pathologist is not present. Should collaborate with the speech-language pathologist for interventions and teaching strategies. Project Ideal, Speech or language impairments, Retrieved from http://www.projectidealonline.org/v/speech-language-impairments/ on October 28, 2018. Types of Impairments There are three basic types of speech impairments: articulation disorders, fluency disorders, and voice disorders. Who can help? As with all students who receive special education services, collaboration of a multi-disciplinary team is necessary. Students with speech or language disorders will receive services from many education professionals, including general education teachers, special education teachers, and speech-language pathologists. Specific learning disability means a disorder in one or more of the basic psychological processes involved in understanding or in using language, spoken or written, that may manifest itself in the imperfect ability to listen, think, speak, read, write, spell, or to do mathematical calculations, including conditions such as perceptual disabilities, brain injury, minimal brain dysfunction, dyslexia, and developmental aphasia. Disorders not included. Specific learning disability does not include learning problems that are primarily the result of visual, hearing, or motor disabilities, of mental retardation, of emotional disturbance, or of environmental, cultural, or economic disadvantage. "A sever orthopedic impairments" that adversely affects a child's educational performance. It basically can classified by 3 categories with Neuromotor, Musculoskeletal and Degenerative. Degenerative: primarily deals with the degeneration of our body's muscles, which cause to have limited mobility. Allow for recording using multiple different technologies. Adapt written lessons to oral/ technology base. An Impairment, that even with correction, adversely affects a child's educational performance. The term includes both partial sight and blindness. Avoid glare in general from overhead lights. Consider placing light filters on fluorescent lights. What is the difference between Deaf and Hearing Impairment? age of onset, educational background, communication methods, and how individuals feel about their hearing loss. The difference between hearing impairment and deaf changes depending on your standpoint on the issue. It is usually broken down into a medical vs cultural definition. The most quiet sounds heard by people with their better ear are between 40 and 70 dB. People who suffer from moderate hearing loss have difficulty keeping up with conversations when not using a hearing aid. The most quiet sounds that people can hear with their better ear are between 25 and 40 dB. People who suffer from mild hearing loss have some difficulties keeping up with conversations, especially in noisy surroundings. The most quiet sounds heard by people with their better ear are from 95 dB or more. People who suffer from profound hearing loss are very hard of hearing and rely mostly on lip-reading, and/or sign language. People with hearing loss may use speech, lip reading, reading or a print transcriber to communicate. A person who defines themself as hearing impaired can often hear some sounds but may not be able to understand speech, or not hear sounds but have no connection to a deaf community. The most quiet sounds heard by people with their better ear are between 70 and 95 dB. People who suffer from severe hearing loss will benefit from powerful hearing aids, but often they rely heavily on lip-reading even when they are using hearing aids. Some also use sign language. With advances in technology such as Cochlear Implants the lines are being blurred meaning that many people with hearing impairment are able to communicate orally and participate as a 'normal' person. Some people may not be ready to admit the severity of their hearing loss and prefer to use the term hard of hearing as it has less connotations of disability attached to it. How do Deaf people view themselves? People who identify as Deaf use sign as a primary means of communication and is often their native language and may not lip read. The deaf community has its own unique culture. Deaf and hard of hearing people produce plays, books, artwork, magazines, and movies targeted at deaf and hard of hearing audiences. The deaf community is also involved with social and political activities exclusive to them. "The pathologic view tends to look at deafness as a disability that can be corrected via medical treatment so the deaf person is "normalized." In contrast, the cultural view embraces the identity of being deaf but does not necessarily reject medical aid." Make copies of your lesson content available for students to take away and review . Teach sign language to the class/ school as a whole. At least simple phrases such as 'Please, thankyou, line up, sit down etc to help D/ HH student feel valued and included. Text and other Adaptive Telephones (TTY) - provides access for students who can’t use amplified telephones. Examples include PDAs, Blackberries, Sidekicks, and videophones. Face to face communication systems - provides assistance when face to face conversations are necessary. It allows student and teacher to type messages back and forth on two keyboards with displays. C-Print and TypeWell - which provide condensed meaning for meaning instant translation of spoken words into text. Text to speech, word prediction, or another type of assistive technology (helps with competency in reading). Captioning services for video/ audio productions - provide captioned audio and video productions to support equal access to content. Caption display spoken dialogue as printed words on a television or computer screen. these help people with varied degrees of hearing loss for telephones and alerting devices. An audio system that uses infra-red light waves to transmit the sound clearly. A strict line of sight is required and natural light may interfere with the transmission. Students can hear a teacher’s voice through the use of a wireless microphone and receiver. Students can wear them with or without a hearing aid. This device helps to enhance the signal-to-noise ratio. This sends the teacher’s voice to speakers around the room. This allows more than one student to use at a time but does not benefit signal-to-noise ratio, especially if it is a noisy environment. Individuals with ASD often need reminders throughout the day in order to stay calm and directed. Record a message with calming techniques on communication buttons that the individual can listen to throughout the day. "I can take a break at 3 o'clock." "Breathe in... (pause)... breathe out." Individuals with ASD often find it difficult to transition from one activity to another. Using visual schedules is helpful in these transitions. But a visual cue before a task is coming to an end allows these individuals time to "gear up" for a change. Using a visual timer such as the Time Tracker gives individuals with ASD cues about how much time is remaining for a task and when time is coming to an end for an activity. This makes for a smoother transition. Sometimes people just need a break. Use a communication button with a message like "I need a break". Then set your visual timer to allow for a short break. Record music clips on several Talk About! buttons and mount them in the "chill out" area. Put pictures that represent the type of music on the button. Then the user can choose what to listen to. Free music downloads for educators can be found at sites such as http://www.royaltyfreemusic.com/free-music-program. better when there is also a paired voice prompt. Although "paper" schedules are beneficial, many individuals will perform better when there is also a paired voice prompt. Use simple communication buttons, such as the Talk About! to create" talking" visual schedules. Velcro pictures or objects to each button and place the buttons in the order in which tasks should be completed. Velcro the buttons to a wall, table, or other surface. If you need a portable, inexpensive voice output visual schedule, Velcro the Talk About! buttons to Talk n Tote Board. Social Skills Try to develop social skills with technology and methods that can help individuals recognize facial and behavioral cues that can help social functioning. FaceSay Social Skills Software Games FaceSay produces games that can help ASD children/adults to better recognize behavioral and emotional cues. Their focus is on students who can benefit from this software in school and friendship relationships. In order to function independently, daily living skills such hygiene, organization skills, and recreational skills are important. Life Skills Winner is an application that allows users to score points while learning daily living tasks in an interactive setting. The application is available through the web and also on mobile devices. A speech-generating device is "a portable that contains one or more panels or switches that when depressed will activate pre-recorded digitized or synthesized speech output." These may be a standalone device, usually very small and light, or it can be software that is installed in a tablet or phone. GoTalks are a type of speech generating devices. GoTalks are offered with various amounts of communication options and sizes. Segmenting the classroom helps clarify the expectations. Once learners are taught expected behaviors for each physical space in the classroom, the distinct areas become powerful cues for what’s expected. The types of boundaries used may vary depending on the age of the students, the students’ familiarity with structured classrooms, the classroom setting, and the strengths and needs of individual students. Changing the environment for different activities. EG: A small group table is used for an art project and also for cooking projects, staff may put a tablecloth on the table during the cooking project to help students know what to expect when they arrive at that location. If a student with ASD is presented with too much information this will slow down or completely stop the processing of information. Teachers should consider how much information is posted on the walls of their classrooms and try to present everything in an organised and clear way. They should try to hang work out of the eyeline of a student with Autism. Teachers should think about things that could cause a distraction through sound such as seating close to window, hallway, PA systems etc. Up to 95% of autistic children have difficulties regulating their sensory system, which is often referred to as sensory processing disorder. 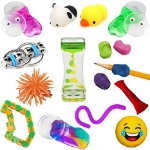 Sensory toys can help relieve stress and improve focus for autistic children as they attempt to learn in a busy classroom environment. It allows students to self regulate and keep themselves on task. Difficulties with transitions between tasks and activities is common through the full range of the autism spectrum. Having visual schedules will greatly assist with the transitions related to moving between the classroom, lunchroom, playground etc. Hurth, J., Shaw, E., Izeman, S., Whaley, K., & Rogers, S. (1999). Areas of agreement about effective practices among programs serving young children with autism spectrum disorders. Infants and Young Children, 12(2), 17-26.
pair students with others sharing similar interests. Give students with TBIs extra time to complete tests. Break down complex directions into smaller steps. Help the student to learn how to use a day planner. Get to know the student as an individual. (1) Google Sites (n.d.). Inclusion Resource: Disability Categories Under IDEA. Retrieved 2 November 2018 from https://sites.google.com/site/inclusionresourcenotebook/disability-areas. (2) Special Education Guide (2013-2018). Traumatic Brain Injury. Retrieved 2 November 2018 from https://www.specialeducationguide.com/disability-profiles/traumatic-brain-injury/. The curriculum should take on a stronger preparation and life skills emphasis. This will improve the child's social skills, life skills, and improve their struggle with rate of learning if these skills are reinforced daily. Give students written explicit instructions that they can reference so that short-term memory problems do not impede upon their learning. Instructions and lessons should be taught with explicit, concrete language. Abstract ideals and complex vocabulary should be avoided when possible. Effective methods to present information include: modeling, scaffolding instruction, visual aids, graphic organizers. The classroom should be organized in a way that gives access to assistive and adaptive resources so that all students can participate despite physical handicaps. Defintion: Significantly sub average general intellectual functioning, existing concurrently with deficits in adaptive behavior and manifested during the developmental period that adversely affects a child’s educational performance. Although listed as a category under federal law, other titles have been adapted for this disability. Trouble remembering information especially short-term memory. Much slower learning rate Intellectually disabled students may need 20-30 trials to learn the same information as a student without the disability. Difficulties with focus. Trouble acquiring, remembering, and internalizing information. Significant challenges in social development which may cause constant classroom disruptions. Physical handicaps and slower rate of physical development. POSSIBLE REFERRAL CHARACTERISTICS : Referral characteristics for the student with another health impairment (OHI) do not fall into specific intellectual, academic, behavioral, language or physical categories. Indicators of another health impairment may or may not be observable. E. Communicative Abilities (Required as indicated below) A comprehensive language screening measure is required. Screening instruments must be established and validated for such use and assess areas of receptive and expressive language. These instruments cannot be single-word vocabulary measures only. Review of social, educational, and communication history and/or classroom observation of communicative abilities should also be utilized. If the student fails the screening or if language is identified as a problem area, a diagnostic measure is required. The possible need for and effects of medication. For most types of health impairments, a physician's diagnosis serves as the basis for classification. However, for the student with ADD a more multidisciplinary approach to diagnosis is desirable. This is particularly necessary for making a differential diagnosis, as ADD can overlap with various learning and behavior disorders. The most common of such overlaps are the conditions of specific learning disabilities and emotional disturbance. Typically, assessments for ADD are comprehensive, involving input from both home and school, and include an evaluation of the child's medical, psychological, educational and behavioral functioning. Children with an "other health impairment" due to chronic or acute health problems often require accommodations, adaptations and/or modifications in their educational program and setting. In addition to specialized instruction, there may be a need for the provision of related services such as specialized transportation, assistive technology devices/services, school health services, parent education/training and counseling. Due to the nature and extent of some health impairments, some students may need major modification of their school day including, but not limited to, rest periods, a shortened school day and/or flexible scheduling and services delivery. Individuals who are deaf-blind will often need touch in order for them to be sure that their partner shares their focus of attention. The individual may have very slow response times. Therefore, the teacher should allow time for the student to respond.